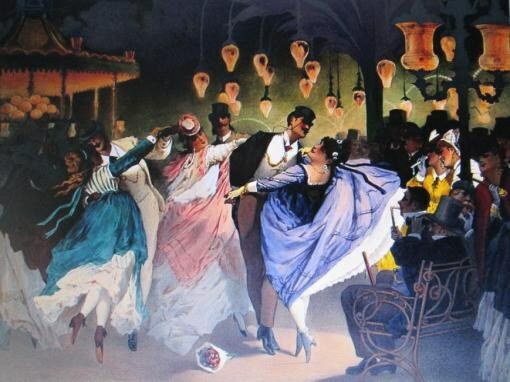 Before the French revolution the king of dancing was considered a measured minuet. Then was replaced by the waltz. The music was composed by many composers. Delicate captivating melody everybody knows, she thrilled the hearts calling and circling in a light graceful dance. "Waltz" is a German word, it is based on the verb "to whirl". To dance with the whirling people began long ago. It is believed that many famous Viennese waltz originated from the Austrian dance "Ländler", which seemed more rough, not having the lightness and smoothness. Many composers drew attention to a new dance and composed music for him. Austrian composer Johann Strauss (the elder) his life was devoted to dance music, especially waltzes. After it radically changed the attitude to the creation of melodies which became popular for dance. From easy and short works intended for entertainment, they turned into deep soulful music, exciting the souls of the listeners. 152 works of this genre created by the talented musician, use special popularity "Waltz of the bayadères", "song of the Danube", "Lorelei", "Taglioni", "Gabriela". The sons of Strauss, too, was musically gifted people. Joseph died early, and the name of the eldest son Johann gained international fame. Johann Strauss (the younger) became interested in music against his father's wishes, wanting to see his son a lawyer or a businessman. The younger Strauss had great abilities of the musician, their first dance ringtones wrote at the age of six. At 19 he created friends own ensemble, subsequently overgrown to the orchestra. Played it on the violin or performed the duties of a conductor by the author. Surpassed famous ancestor son has perfected the father's Viennese waltz, he wrote more than three hundred tunes in this genre, for which the consensus received the title, "the waltz king". These masterpieces are considered to be "tales from the Vienna woods" and "Blue Danube" representing the unity of different national tunes. The solemn procession of the new dance in Europe continued. The famous Russian composer M. I. Glinka, inspired with love to Catherine Kern, who wrote beautiful, filled with love and flight of the imagination "Waltz-fantasy". For a long time, Glinka was carefully polished his work, removing everything unnecessary from the orchestra performance. The first poetic sketch turned into a major play-poem. New sounds "the Waltz-imagination" was first presented to the public in Pavlovsk, and conductor of the orchestra was Strauss himself. Russian symphonic waltzes originate from this musical works of M. I. Glinka. For centuries, listen to the famous waltz from Tchaikovsky's ballets "the Sleeping beauty" and "Nutcracker". Waltz is part of the musical Suite by Aram Khachaturian "Masquerade", composed for the dramatic poem of M. Y. Lermontov. In the romantic noble music of Khachaturian has affected human passions: love and jealousy, despair and deceit. Russian musical life more recently had a wonderful tradition: summer in the city parks played brass bands. Old Russian waltzes were an ornament of concert programs. The authors of many musical compositions were Russian military conductors. Enough fame I. A. Shatrov, the author of the famous waltz "On the hills of Manchuria". Popularity and its "Summer dreams", created under the influence of love. Soviet composers have not paid attention to this genre, and in the difficult period of the great Patriotic war. M. Blanter set to music a poem by M. Isakovsky "In the forest frontline" - there was one of my favorite waltzes wartime. In the works of K. Listova "In the dugout", by M. Fradkin "the Accidental waltz" and others too heard a similar sound. Honored master song Yan Frenkel said that the preference to waltz, he gave because of the special confidence of the musical form and fits a wide range of images. Special effect produces in the listener a simple song Y. Frenkel "the separation Waltz", which became famous after the release of the feature film "Women". I. Dunaevsky composed the music of the "School waltz" to the words of the poet M. Matusovsky. Imbued with a kind of sad lyrical melody in the soul awakens pleasant memories of youth, school. The song got amazing success. And now she will care about the human heart, is a musical attribute of the school Proms. Beautiful waltz melody from the film "My tender and gentle beast" has become a favorite of many people. Component of the "live nerve" of film music without words like conveys someone's emotional drama, calls in the world of dreams and again returns to earth. Downloads touching melodies Eugen Doga exceeded the expectations of the author. Now she always sounds in marriage palaces, calls on the newlyweds first dance.